I have seen the 992 and from the front it is exactly the same as the previous generations. I want to upgrade from the 997 looks, which is or was fine for the price and time. But I don't want to spend a ridiculous amount of money to get a car which looks the same. Anyone else feel that way? I actually prefer the looks of the latest Cayman, and it is so cheap but I can't get it because I need at least four seats. Every other car manufacturer improves the looks of a model significantly. Like my current daily is a 640d, the new 8 series (successor to 6 series as 6 series is being stopped) has a marked improvement from all corners visually from my current model. The visual improvement makes me want to buy the 8 series in the future. The front of the 992 looks exactly the same as the 991. Does anybody else feel that way? The car will be excellent to drive, I know I've had 911 for a few years, but design is also a feature and I'm not happy that it's not changing at all. Generally speaking, all Porsche look the same. It is only owners and enthusiast that can tell the differences between each generation. Yes I can recognise the different models of 911, however I wouldn't say all Porsche look the same. The Cayman has a far more modern design language, sharper lines and modern looks. The 911 looks dated now from the front, from the back it is all good for me. We need a more aggressive looking front end, the VW beetle soft looking design is keeping it back. I've already paid for a car which looks like the 992, I don't want to buy another one which looks the same. So we're stuck for another 7 years with the same design. I agree that the 997, 991 and 992 are very similar from the front but I'm not complaining. Look what happened in 1998 when somebody with a lot more influence than us fancied a change. ps. I don't think your revised spelling of Porsche will catch on either. Look at the trouble BMW had when Chris Bangle changed the BMW designs with the 'flame surfaced' nonsense. Everyone hated them. The new Aston Vantage front has gone down like a lead balloon. And what were the LR designers thinking when they did the back of the new Discovery. A 911 needs to look like a 911. The round single bug-eyed headlights are a design signature, but look more friendly than aggressive. I would imagine the 992 with aerokit as and when the GT3 comes out will look great. Perhaps you should be driving an Audi? I'm sure there maybe some that share your thoughts, I'm not one of them by the way. A 911, to me, has to look like a 911. Porsche have other models in their current line up to tweak the design that little bit further, but I wouldn't want to see over fifty years of history designed out. 911s all tend to look the same? Amen to that! I like the idea that someone who bought a brand new 911 from the showroom in 1963, would still recognise a 911 built half a century later. That's half the fun for me. I see car manufacturers struggling to make their facelifted euro boxes look a bit sexier with ever more daft angles and slashes in bodywork, peculiar lights etc etc and it just leaves me cold. The 911 is what it is and three cheers for that! It's a 911, so it's going to (has to) ressemble its predecessor. I like it, not that I can afford one. Re the Cayman, I have a 981S on which I think the front looks better than a 718, but I prefer the rear of a 718. Look what happened when they tried something different on the 996 (had a turbo so I 'm ok with that too). My opinion is precisely the opposite of yours, REKX. I like the front simply because it hasn't changed much, whereas I think they have messed around too much with the back, and I don't like it. The 911 has something that most cars don't have: heritage. Porsche know this and would be crazy to chuck it away. You have to keep your USP otherwise it becomes "just another fast car". I’ve put a £5k deposit down on a 992 I’m not sure about the rear and will make a final decision once I’ve seen one in the flesh,if we don’t think it warrants the extra cost over our 991.2 C4S I’ll keep it. ^^^ Great angle. Lovely car. I was just about to say it isn't so much the styling as the size of everything since the 997. I use my old 996 for B road breakfast blasts and weekends away so the fact each generation gets bigger just doesn't appeal. Then I see a pic like Steves above and realise that either way, Porsche usually nail it design wise. Some models are more of a "grower" than others and take a while to click. 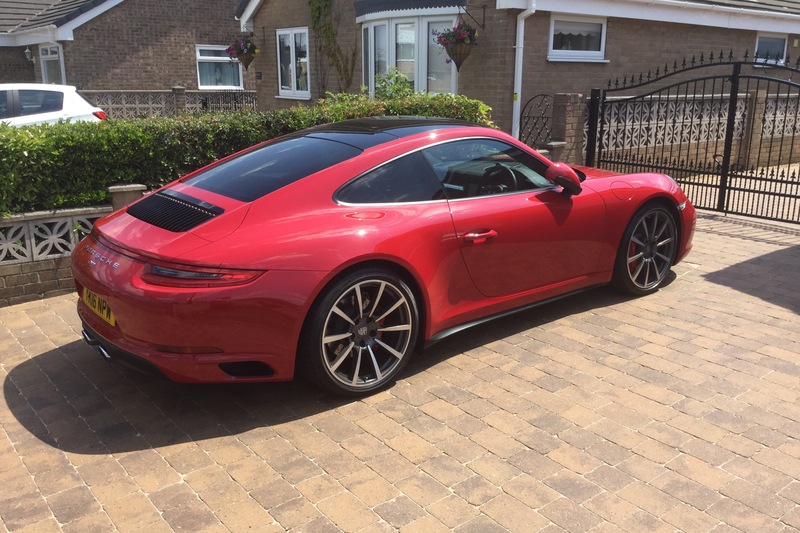 For me personally though, not needing rear seats or daily drive ability, if I was spending £80k plus on a modern Porsche it would be a GT4, a 6/7 GT3 or something aircooled, but for those who want a daily driver, modern one the 992 will still fly off the shelves. Had a nosey around the 992 ‘s in Portsmouth this afternoon. Nice dark blue and a yellow. As ever they have some great lines. disappointment was the interior. The dials/screens look unfinished. And that shelf on the dash ain’t my cuppa tea.